Next time you want to show your passion, do it in fashion! Check out the designs from Rat Trap Press; the artist is a cyclist and screen printer out of Fort Worth. 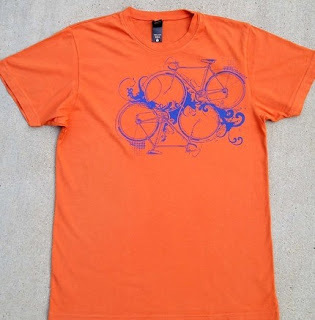 He has several different t-shirt designs featuring bikes and bike parts. I love this double bike design in blue on orange. Pair it with this bicycle birthday card for a great gift to your favorite cyclist.